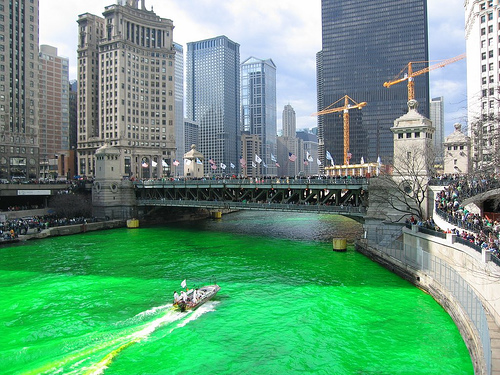 I recently spent a long weekend in Chicago for St. Patrick’s Day. While California, particularly Southern California, has just about everything a person could want, one thing it sorely lacks is a St. Patrick’s Day scene. I’m from the Northeastern U.S., which means the first 17 days of March every year are, in some shape or form, St. Patrick’s Day. Southern California barely has one parade, in New Jersey / New York you’re able to go to three. One the first weekend of March, one the second, and one the actual day. It got so crazy in Hoboken, after 25 years, they canceled the parade to hopefully cut down on the rowdiness. Of course, rather than people going to the bars at 1pm when the parade ended, people ended up going at 9am. So much for that idea. Needless to say, we had a great time. As a random tangent, we also saw a Second City show. Highly recommended. Anyways, it’s Sunday and we’re walking to the train station to go to the airport. We’re a bit lost, so my friend asks this older guy for directions to the train station. The guy helps us out, then goes, “You know, I’m heading that direction. I’ll just show you where it is.” He picks up his two, large bags of Trader Joes groceries, in the 20 degree -but 7 degree windchill- weather, and starts walking the mile to the train station with us. Before leaving, he gave us a few business cards for a charity he works with, involving helping teenagers with substance abuse. He told us to feel free to check it out. All I could think while watching this guy was, “This is how you do it.” Where right in front of me was a blueprint in how to age well, and how to live well in old age. Don’t obsess about it, but eat well. I’m not some Trader Joes zealot, but I don’t feel it’s an overstatement to say those who shop there are more conscious of what they eat than those who don’t. Be social. This guy goes out of his way to make sure he’s consistently around people. He has a social job, he makes his recreational time social by housing foreign exchange students, works with a charity, and he’s not averse to talking to and or helping strangers. Move, and move a lot. Not only is this guy doing marathons, he walks to and from work. Many times with groceries in his hands. He also has a job where he is likely on his feet a good portion of the day. I love science, I love technology, but I doubt this guy went out of his way to stay up to date with the current advances in human physiology. It’s always good to take a step back and show how simple things can be. Have you checked out ‘Blue Zones’? I highly suggest it! Also, ‘The China Study’ is a fantastic resource. I’ve read Blue Zones, but not The China Study, although I’m familiar with it. I wasn’t thinking about it, but the bullet points from Blue Zones and the ones I outline here are quite similar. Good point bringing up that book.